I left Joshua Tree before the sun rose in the east. While the stars still formed timeless patterns in a crystalline night sky. Descending from the mountains on Twenty Nine Palms Highway, to meet the flat desert floor and US-10, shapes slowly began to emerge from the dark. Shadows became crisp. Behind me a warm yellow sun forced everything into detail. As I traveled west, skirting the City of Angels, I wondered what I was going to find on an island twenty miles out in the Pacific Ocean. As always, I had done my homework. I had a working knowledge of the island’s history and ecology. I knew Santa Cruz was home to many species of plants and animals found nowhere else on earth. I knew the remains of a 13,000 year old leg bone had been found on Santa Rosa Island, making it the earliest known human presence in North America. As the 101 lead me to Ventura Harbor, what I didn’t know, couldn’t know, was how the sweeping beauty of an ageless volcanic island would soothe and restore. The five Channel Islands sit majestically independent, twenty-five miles from the California coast. Never connected to the mainland, the four northern islands were once part of a single Pleistocene ‘super-island’ known as Santarosae. It is this separation that has shaped all life on the islands. 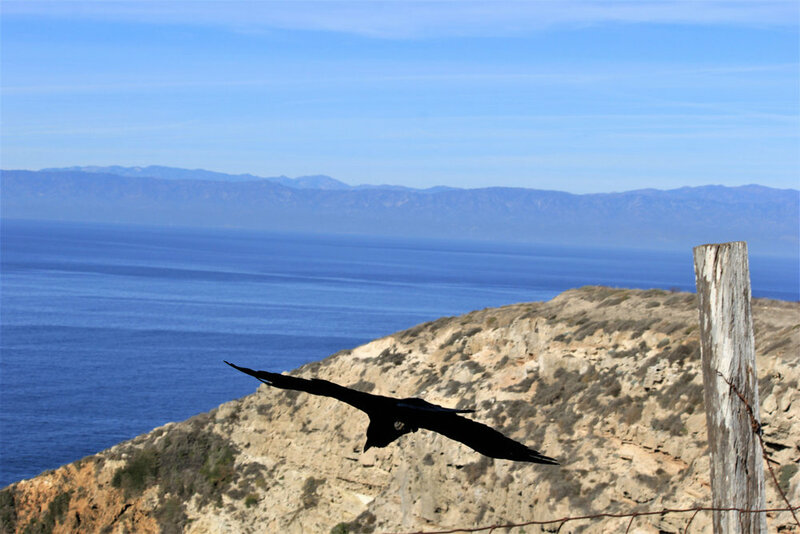 Freedom from predators and human interference since the 1970’s, Santa Cruz Island is home to one of the largest breeding grounds of nesting seabirds. Access to an abundant food source, also provides an ideal sanctuary for California sea lions and harbor seals. The endangered Santa Cruz Island fox, once 1,500 strong before golden eagles found their way to the island, are rebounding in number. Island scrub jays, unique to Santa Cruz, thrive. 578 native plant taxa, including species, subspecies, varieties, and forms, have been identified in the park. As I board the boat for Santa Cruz, I am thinking of the Garden of Eden and hoping I don’t see an apple tree. Santa Cruz Island fox. About the size of a large house cat. The bushy tail of a grey fox I saw in Guadalupe Mountains NP was larger than this tiny fox. I believe this is a Horned Lark. As I was was taking pictures of him, only his head moved. His body remained perfectly still. Island Packers is the official transportation provider to the Channel Islands. As I stood at the back of the line to board, several people dressed in normal clothes – which is to say not hiking and exploring clothes – are in line. They have large suitcases as well. As I am about to ask the gentleman in front of me what’s going on, a young man announces that “anyone going to Santa Barbara should not be in this line.” All of the nicely dressed people with suitcases step out of line and it hits me. Deadly mudslides on the 101 only a few days before my arrival have made the road to Santa Barbara impassable. The only way home was by sea. I later learned that Island Packers had discontinued service to one of the Channel Islands in order to service the people displaced by natural disaster. After listening to a crew member detail what we can and can’t do on board during the one hour tip to Santa Cruz, I walked forward to the bridge. How would you describe the water today – I asked the captain. “This is a good day. Smooth. A little chop, but nothing compared to what we had earlier in the week with the storms. Nice and sunny. You’re lucky.” (Author’s note: please see piece on Joshua Tree for reference) Any suggestions as to which hikes I should take? “Depends on what you want to see. If your looking for spectacular views, go up to Potato Harbor or Cavern Point. Perfect day for either one.” I’m always looking for a good shot. Also looking for a trail that helps define the park. “Potato Harbor. Just go sit. You can thank me on the way back.” I appreciate it. Thanks in advance. The ride across Santa Barbara Channel was beautiful. Directly ahead to the west, bathed in blue sunlight, sat a string of mountainous islands. Behind me, the California coastline. The water was relatively smooth. Suddenly the boat slows and begins to turn to the south. “On your right, sitting on a channel marker is one of our California sea lions. I’m going to take a moment so anyone wanting to get a better view can do so.” Naturally I’m on the wrong side, so I scramble across and start clicking. From a distance the sea lion appears soft to the touch. A light, fading into deep brown, whiskered creature, he stares back at us, seemingly indifferent to the attention. He doesn’t make a sound. As the captain brings the boat back around, I imagine the sea lion blowing out a large puff of air, released from his manly pose for the daily visitors. I think he practices this pose. Chest out, chin up. After the boat leaves he fires up a smoke. Disembarking, we walk across a long gangplank. Looking into the clear water, what appears to be large strands of kelp rise from the ocean floor. I’ve seen kelp and seaweed before, but nothing on this scale. Countless twenty foot brownish-yellow leaves float on the surface, anchored to the bottom and held afloat with small air-filled pods. It is literally a forest of giant kelp. Beneath the water, the leaves appear greenish-blue, merging with the ocean’s color. You can see where they anchor the bottom and trace their gently swaying bodies to the surface. The current moves them in a graceful dance. I haven’t set foot on solid earth and I am already amazed. Giant leaves of kelp. The yellowish-brown color on the surface beautifully contrasts with its blue-green appearance under water. There’s a metaphor in there for everyone. It’s a short walk to Scorpion Ranch and the small visitors center. I meet Jim, a volunteer who quickly confirms what the captain had told me. “Potato Cove if you want a great hike along steep cliffs. Great views.” After asking him where I could find a postcard, which they didn’t have, I stamped my book and a small piece of blank paper and headed up the trail toward Scorpion Valley. Potato Harbor is about a five mile hike, round trip. After passing through a small campground and a grove of peeling eucalyptus trees, the trail begins a steep climb through white chalky deposits of diatomaceous earth. As you climb to the ridge line, views of the valley below lay out in front of you. Folding hills brush up against each other, a sunny haze blocking their color. After several switchbacks, the trail levels out and an ocean breeze reaches you before the breathtaking view. As I make my way around a final bend, I come upon a young man sitting quietly, gazing out at the ocean and the dark blue smudge of the California coast. 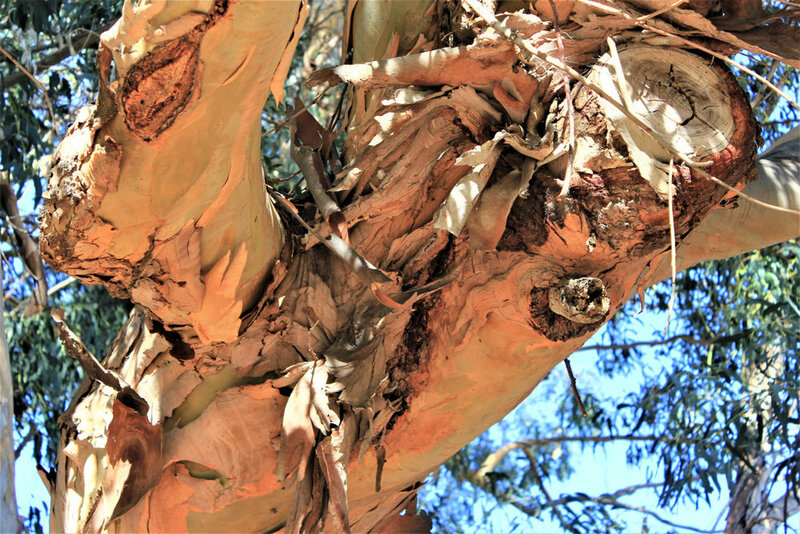 One of many large Eucalyptus trees shading the campground. I loved the texture of the peeling park. I felt as if I were intruding, but asked. Isn’t this magnificent? “Yes. It’s amazing.” I hope I’m not bothering you. “No. I’m just trying to take it all in.” It’s difficult. “It is.” We sat in silence for a while, each with our own thoughts. I’m Smitty. He told me his name. “It’s a fairly common Indian name.” Joshi is your last name? “Yes.” Am I pronouncing it correctly? “Yes, Joshi.” How old are you? “Twenty nine.” We sit a while longer. Then I hear a small chuckle. Then another. What are you thinking Joshi? “How beautiful this is. How fortunate I am to be sitting here.” I feel that way quite a bit. I told him about TheMountCo Project and asked what he did for a living. “I’m a scientist at Temple. I was at a conference in LA and decided to come here after it ended. My brain was fried. I needed this.” It’s a good way to clear your head. “It gives me tremendous perspective. The work I do is important, but this…” His voice trailed off. One of the first views when reaching the top of Potato Harbor trail. After Joshi and I took several photos of each other, we said goodbye and I headed further up the ridge to Potato Harbor. As you walk the wide white trail, sounds from the Pacific Ocean follow you. Raven squawks echo back from the steep cliff walls. The warm winds flow up the rock, pass over me and sweep across the bluffs. I am aware of being inside a visually perfect day. When you reach the Potato Harbor overlook, there is a place to sit on the ground, relax and enjoy the stunning view. To the west sits the bulk of the largest island off the west coast of the United States. Much of the 96 square mile island – everything west of Prisoners Harbor – is managed by The Nature Conservancy. A small, non-profit organization, The Nature Conservancy and National Park Service work together to ensure the protection of the island. Unlike the National Park Service portion of the island however, to hike on land managed by the Conservancy you need a special permit. To the left, at the top of Potato Harbor, a small steep trail leads down and out of sight. It’s at the cliff’s edge, there are no rails and it’s not much of a path for that matter. But I thought it might lead to a better view, so it really wasn’t a difficult decision. A short walk down the narrow path, a little slide down some rocks and there it is. The best view of Potato Harbor. I sit and take photos. Then I just sit. I can hear waves softy pounding the small beach hundreds of feet below. Sea lions bark and moan, their voices circling the horse shoe harbor then flung to the ocean. A breeze provides background music. I have the feeling of being serenaded by a three piece orchestra, just before I fall asleep. Potato Harbor. Several sea lions were resting on the triangular shaped rock. Potato Harbor from the end of the trail – plus. Caves cut into the volcanic rock of Potato Harbor. When I woke up, I scrambled back to the top and the viewing area. It was empty. I looked at my phone – exactly 90 minutes to get back to the boat. I retraced the ridge line for a little over a mile, until it forked. To the right was the harbor blow. To the left and seemingly straight up, was Cavern Point. I turned left and started to climb. My thinking was that heading downhill would be quicker than the climb and I could make up some time. Who wants to get to a boat early? The path to Cavern Point stayed away from the cliff’s edge, but turnouts existed if you wanted to test your footing. Each one provided a new view of the island. Each allowed you to see something that the last vantage point did not. One hundred foot rocks filled with birds sat just inside a cove. Massive beds of giant kelp floated next to shore, clearly visible even from the sandstone cliffs. Caves carved from the rock over thousands of years, invited water in and then sprayed it back to the sea when it found its end. Part of the trail leading to Cavern Point. Island Packers picking us up at the end of a long day. I regret not staying longer. I will return to the Channel Islands. Leaving Scorpion Harbor. In the distance is Anacapa Island, the southernmost Channel Island. You have two options. Wait until you see them emerge and try to quickly focus the camera. Impossible. Keep your camera focused on a small part of the ocean where you think they might appear and get lucky. I got lucky. View of the Channel Islands from Ventura Promenade. I met a young man by the name of Andy on the promenade. I think he was 22. Wise far beyond his years. One of the best conversations of the trip. This is Rocko. He’s a Sagittarius, single and likes long walks along the cliff at sunset. Hoping the perfect raven swipes right. These are my knees. I took this photo for a couple of reasons. 1. To promote TheMountCo. 2. I just woke up from a nap and remembered I am supposed to take photos. The southern wall of Potato Harbor. 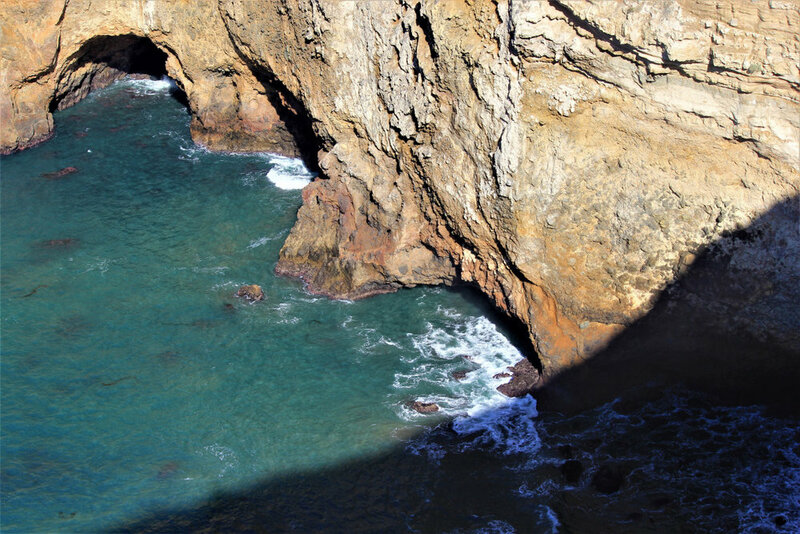 Near the end of the sloping rock, the sea has carved tunnels. A sea lions rests on the rock. I’m still trying to figure out how they climb onto rocks so high. Rocko in flight. It was wonderful to watch him soar on the updrafts. Wings outstretched, never flapping, only changing angles. This is Bertie. She lives alone.